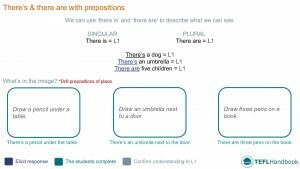 A collection of ESL activities and games to teach the correct usage of there is and there are to beginners (A1). You can use this as a stand-alone lesson plan, or to supplement an existing one on a similar or related grammar topic. The board work below shows one way that we could introduce the target language for this lesson. 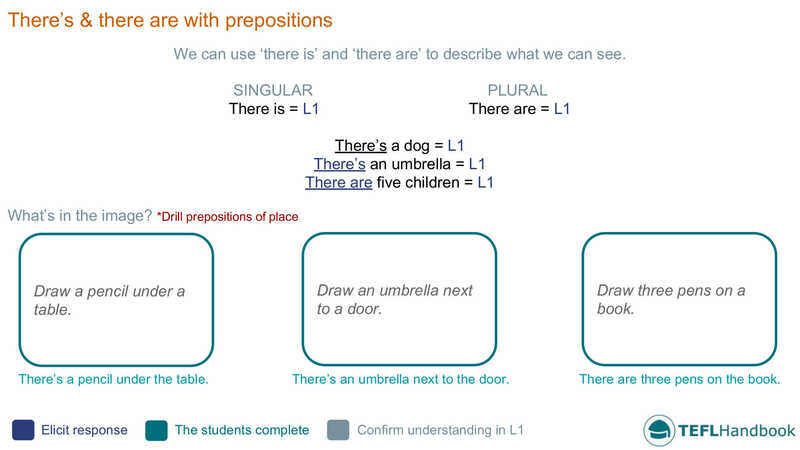 Start off by explaining the difference between the singular and plural constructions. If possible, clarify in L1. After that, draw the three images on the bottom half of the board and have your students make a 'there is/are' + noun + preposition sentence that describes each image. If you use an iOS or Android device, don't forget that you can get offline access to these materials, along with a much more extensive selection of ESL lesson plans, through the TEFL Handbook app. A fun speaking activity where the students have to form statements based on clues from the teacher. Start by telling your students that you are thinking about an item in the classroom and that they must guess what it is from your clues. You'll then give out a series of statements that should elicit guesses from the group that use the target language for the lesson. Teacher: They are on the shelf. Student: There are books on the shelf. Teacher: They are next to the books. Student: There's a teddy on the shelf. The students are going to help you to write a description of the classroom on the board. For this speaking and writing activity, you will try to elicit statements that describe the classroom. Do this by pointing at different objects or asking how many of each item there is. Then have a student construct a sentence that correctly uses the target grammar for this lesson and add it to the board. There are fifteen students in the class. There's one teacher. There are three shelves on the wall. There are lots of books on the shelves. There's a box of books next to the door. Do as many as you feel are necessary, and If you can, have students translate each statement as you go. Students have to write a few statements that describe their living room. The students will now switch gears and write a similar description of the living room in their house. If you need to, add some useful vocabulary (along with pictures) to the board before they begin. As always, we only include ideas that require the bare minimum of resources (whiteboard, markers, dice(dice app). Players have to draw images on the board to communicate a phrase to their teammates. 1. There are (two) children behind a tree. 2. There's a cat under the chair. 3. There's a dog driving a car. 4. There are bananas on the table. 5. There's a fireman on the beach. 6. There's a basketball on his head. With weaker groups, you should guide the students toward the sentence you want them to say by asking the appropriate questions. Be sure to check out our full list of ESL lesson plans for beginners (A1 Upper), as well as our complete selection of EFL - ESL lesson plans. If you use an iOS or Android device, have a look at the TEFL Handbook app. An ESL lesson planner for English teachers. It has a lot more content and gives you faster access to our ESL resources, making it easier to use in class.